I thought it’d be useful to summarize Trump’s many-fronted attack on the Mueller investigation today. As part of the GOP obstruction efforts, the House Judiciary Committee will have Peter Strzok for a public hearing Thursday, without (at least thus far) providing him with a transcript of his 11-hour testimony before the committee two weeks ago. In his increasingly frequent rants about the Witch Hunt, Trump continues to focus on Strzok’s role. Incidentally, I made some initial outreach to do an informal briefing with some Republican members of Congress about what I know about the election year tampering, but learned the committees were too busy with Strzok and related issues to hear from me. The AP did not include Rudy Giuliani (among others, including Trump himself) in the list of those it reached out to for comment. Meanwhile, the Mike and Maggie team at NYT continues its practice of writing stories that claim to track a grand new Trump legal strategy, but along the way mostly maps out either Trump spin emphasizing obstruction or just outright misunderstanding of the case against the President. In the most recent installment, Mike and Maggie claim the obviously consistent half year strategy of inventing excuses not to do an interview is a new one. President Trump’s lawyers set new conditions on Friday on an interview with the special counsel and said that the chances that the president would be voluntarily questioned were growing increasingly unlikely. The special counsel, Robert S. Mueller III, needs to prove before Mr. Trump would agree to an interview that he has evidence that Mr. Trump committed a crime and that his testimony is essential to completing the investigation, said Rudolph W. Giuliani, the president’s lead lawyer in the case. At one point, they even claim that the raid against Michael Cohen — as opposed to the mounting evidence that Mueller was examining Trump’s role in “collusion,” not just obstruction — that led Trump to take a more aggressive stance. But in April, Mr. Trump concluded that Mr. Mueller and Justice Department officials were determined to find wrongdoing after federal investigators in New York, acting on a referral from the special counsel, raided the office, hotel room and home of Mr. Trump’s longtime personal lawyer Michael D. Cohen. 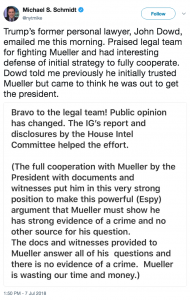 The most curious aspect of the story is Rudy’s claim that if Mueller — who as early as March was asking around 13 questions about “collusion” — could show real evidence, then Trump would be willing to sit for an interview. “If they can come to us and show us the basis and that it’s legitimate and that they have uncovered something, we can go from there and assess their objectivity,” Mr. Giuliani said in an interview. He urged the special counsel to wrap up his inquiry and write an investigative report. He said Mr. Trump’s lawyers planned to write their own summary of the case. This is an area where NYT could have laid out the evidence that implicates Trump personally, to show how silly this line is. After that article, Schmidt weighed in twice more on Twitter, asserting that because Mueller told Trump’s team he needed to question the President for obstruction earlier this year, that remains true. Mueller told Trump’s lawyers earlier this year that he needed to question the president to know whether he had criminal intent on obstruction issues. Hard to believe Mueller doesn’t try and do everything in his power to get Trump to answer those questions. 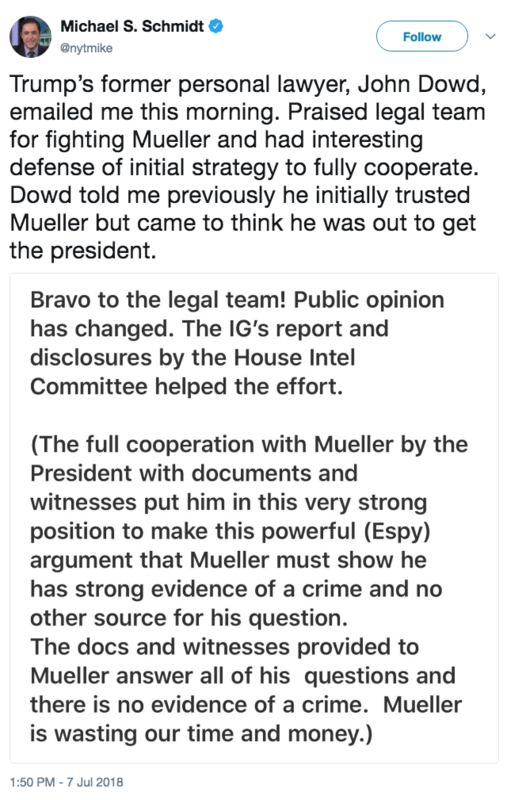 Schmidt also posted Dowd’s self-congratulation for his own strategy cooperating long enough to support the defense team’s current position that Mueller would have to show strong evidence of a crime to be able to subpoena the president to testify. In what must be the result of aggressive White House outreach, Rudy Giuliani appeared on several outlets this morning, following up on the NYT piece. On ABC, he nuanced his claim about whether Trump would sit for an interview, saying not that Mueller would have to show evidence of a crime, but that he’d have to show “a factual basis” for an investigation into Trump. STEPHANOPOULOS: Let’s talk about Robert Mueller. The New York Times reported that President Trump won’t agree to an interview with Robert Mueller unless Mueller first proves he has evidence that President Trump committed a crime. That was based on an interview with you. Is that the current condition? GIULIANI: Yes, but I have to modify that a bit, look at my quote. My quote is not evidence of a crime, it’s a factual basis for the investigation. We’ve been through everything on collusion and obstruction. STEPHANOPOULOS: We have James Comey’s testimony. GIULIANI: Well Comey’s testimony is hardly worth anything. 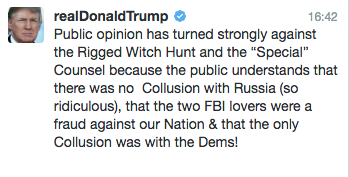 And — nor — nor did he ever — James Comey had — never found any evidence of collusion. And rules out obstruction by saying the president had a right to fire me. So all the rest of it is just politics. I mean, the — the — the reality is Comey, in some ways, ends up being a good witness for us. Unless you assume they’re trying to get him into a perjury trap by (ph) he tells his version, somebody else has a different version. Rudy went a bit further on CNN, claiming to be certain there’s no reason for the investigation because his team has debriefed all of Mueller’s witnesses (who, according to Rudy, are all part of the joint defense agreement). And these new terms, particularly that Robert Mueller must show proof of Trump wrongdoing to agree to an interview, you actually have said that you don’t think that Mueller would even agree to it. So why do this dance? Why not just tell the special counsel, sorry, no interview? GIULIANI: Well, we’d like to know if there is any factual basis for the investigation originally or they have developed one, because we can’t find one, nor can anyone else, nor have they, with all the leaking they have done, even leaked one, which I think would have happened immediately, because they want to justify themselves. The fact is, I should correct it. I didn’t say they have to prove a crime. GIULIANI: What I said was, they have to give us a factual basis, meaning some suspicion of a crime. For example, I can’t initiate an investigation of my neighbor just because I don’t like him or just he’s politically different from me. BASH: … that there is no evidence — you say that the special counsel hasn’t produced evidence. But they haven’t said that they have no evidence. They have — you say that there have been leaks. They have been remarkably tight- lipped, aside from what they have had to do with indictments and such. GIULIANI: No, they haven’t. They leaked reports. They leaked reports. They leaked meetings. They’re leaking on Manafort right now. They leaked Cohen before it happened. BASH: But this is an ongoing investigation. We don’t really know what they have and what they don’t have. That’s fair, right? GIULIANI: Well, I have a pretty good idea because I have seen all the documents that they have. We have debriefed all their witnesses. And we have pressed them numerous times. BASH: You have debriefed all of their witnesses? GIULIANI: Well, I think so, I mean, the ones that were — the ones that were involved in the joint defense agreement, which constitutes all the critical ones. Rudy said much the same on NBC — the most interesting part of that interview is Chuck Todd’s questions about why Trump would meet with Putin while being under investigation for colluding with him. Central to all three of these interviews is the notion that because Michael Horowitz found that Jim Comey acted improperly in the Hillary investigation, Trump can’t be investigated for anything to do with him — the same story told implausibly in those two leaked letters. The Trump team went to great lengths to spend their limited Sunday Morning political capital on rolling this out as a purportedly new Mueller strategy.